Graf Baldric von Neufwald - Lord of Ubersreik, Siedlung, and Frugelhorn, Baldric has recently inherited his titles from his dead and disgraced father. 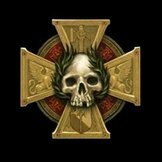 In a conspiracy covered up by those close to His Eminence, Karl Franz, in order to preserve the stability in Reikland while Karl vies for the vacant title of Emperor, Baldric's father led a band of heretics in a plot to murder their lord and his advisers. His failure ended in his death and a purge of his household, but Baldric had been carefully fostered in Altdorf and kept separate from his father's treachery by a farsighted Lector of Sigmar. Now he must rule one of Reikland's largest grafdoms with few resources and little assistance. + At Lector Wilhelm Ottokar's insistence, Baldric has taken Wolfram, Lothar, Kai, and Okri into his employ and will provide for their basic needs. 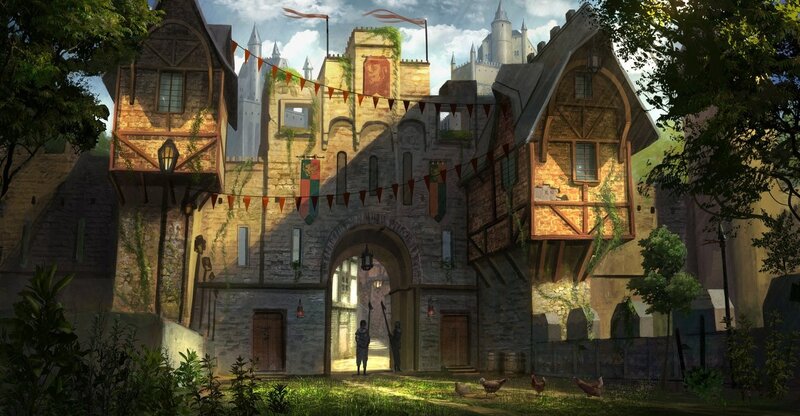 He has opened his castle's stores and armory to the agents for anything they might need while acting in his service. + Initiate Wolfram has been given care of the castle library and is known to act as Baldric's adviser on matters concerning, history, policy, and rule of law. + As Baldric's agent, Lothar enforces his will on the merchants and guildsmen who flock to the castle town at Baldric's new seat. Having spent most of his life in Altdorf, Lothar has been entrusted with ensuring that the gold flows efficiently f through Geissbach and that Baldric's resources are not neglected. + Kai'rildan has been charged with the tracking and execution of the hated beastmen, defilers of the forests. He will most often be found leading a team of green huntsmen on the edges of the Reikwald, doing his best to keep them from falling into traps or an ambush, and keeping the roads safe for travel. + Okri learned enough on the side about structural engineering while working the mines of Karak Varn to surpass even professionally educated men of the Empire. While he still keeps his soldiering instincts sharp with regiments Baldric is trying to form at Geissbach, he is more often seen using hammer and pick to lead the reconstruction of Geissbach's extensive but crumbling walls. Roadwarden Birgetta - A roadwarden from a small town, Birgetta is hunting a High Elven envoy called Vaerun who she accuses of monstrous crimes. Searching for some clue to where her quarry fled after the event's that led to Baldric's father's death, she can sometimes be found at Geissbach between her travels to the nearby towns. + Birgetta can provide news and information from all corners of Reikland. Swordmaster Kolhir - A swordmaster from Caledor in Ulthuan, Kolhir was Vaerun's appointed bodyguard before presented with evidence of his master's nefarious schemes. Now, extended hospitality by Graf Baldric, he waits at Geissbach for word from Ulthuan concerning his assignment. + As an adherent of Hoeth, Kolhir is an extensive source of knowledge concerning High Elves, history, philosophy, magic, and much more. Apothecary Armand - A Bretonnian apothecary ousted from his homeland by ignorant nobles and commoners alike, Armand is quite grateful to Baldric's agents for his chance at a fresh start in the alien lands of Ubersreik. Quite knowledgeable in plants and medicine, Baldric has found him extremely useful and he has been allowed to set up a small office in the castle town. + The Bretonnian spends much of his time in the library's tomes, improving his command of the Reikspiel language and expanding his knowledge of imperial medicine. He has suggested to Wolfram, that he could help the young initiate learn how to cure disease and heal the wounded as an Apothecary, if he would in turn help him commit his own accumulated knowledge to parchment. + Armand can provide knowledge on plants and medicine and will always offer Baldric's agents healing draughts at a reduced price of 15 silver.